Freshly handmade solid Shampoo and Conditioner Bars. 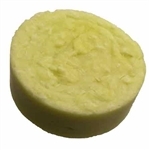 Solid Conditioner Bars for Silky Soft and Shiny Tresses! Avocado Oil's has a light weight formula that’s perfect for hair.